Silver's are #'s 96 of 1000, 858 of 1000, and 860 of 1000. I had the silver cards autographed on December 30th and will post the pictures soon. 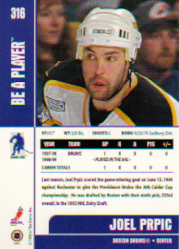 Front of Joel's Card (Card #316 of the Be A Player Memorabilia Set). Front of Joel's Card (Card #316 of the Be A Player Memorabilia Set). 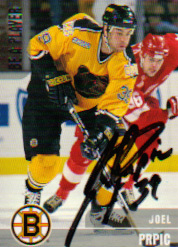 Silver edition autographed by Joel Prpic on December 30, 2001. Back of Joel's card. 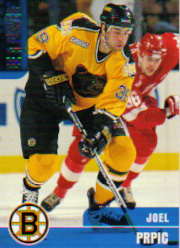 (#14 of the 1997-98 Providence Bruins/Split Second set). Back of Joel's Card (Card #316 of the Be A Player Memorabilia Set). I also have the Silver edition of this card. Front of Joel's card. 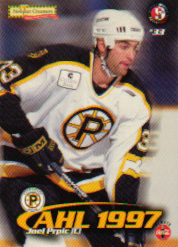 (#14 of the 1997-98 Providence Bruins/Split Second set). 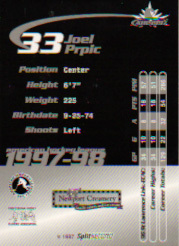 Contact me if you know of other cards that I haven't listed or if you wish to sell your Joel Prpic cards.